Based in Northbrook IL, Homewatch CareGivers Northshore is a professional home care services agency that is devoted to providing comprehensive, professional Alzheimer’s & dementia care and in-home care for seniors with chronic health conditions such as ALS, MS, COPD, Congestive Heart Failure, Diabetes, Cancer and those recovering from Stroke. We are available 24 hours a day, 7 days per week and can provide dependable long term and short term home care services tailored to meet your individual needs. At Homewatch CareGivers Northshore we specialize in providing you with the Best Home Care Professionals in Northbrook Illinois. Homewatch Caregivers employs a wide range of qualified in-home care professionals, including, companions and caregivers, home health aides, certified nursing assistants (CNA), licensed practical nurses (LPN) and registered nurses (RN). In addition to our compassionate team of caregivers, our Homewatch services team can assist you in obtaining durable medical equipment such as walkers, wheelchairs, or Hoyer lifts if needed. Our highly competent and professionally trained in-home professionals undergo extensive interviews, background checks, proficiency testing, and skill validation prior to becoming a member of our team of caregivers. They are managed, supervised, insured and meet all State of Illinois requirements for certification and licensure. Northbrook and the surrounding North Shore Suburbs of Chicago have a wealth of memory care support resources and Homewatch CareGivers has been a trusted provider of Alzheimer’s and dementia care to Northbrook seniors and their families for more than 30 years. Our compassionate and certified dementia care team understands that caring for a family member with memory impairment is stressful, and having a neutral caregiver from outside your family can help ease the emotional burden that comes with caring for a loved one. 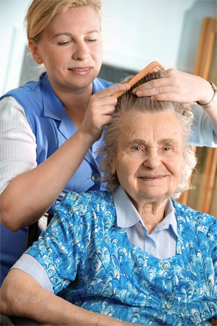 Looking for the Best Home Care Agency in Northbrook for your loved one? The first step to finding the Best Northbrook IL Home Care agency is to determine the level of care that is needed. The second step is to find a home care agency that is caring, compassionate and experienced that can provide you with “real life” client testimonials and customer reviews. We’ve found that the best advice usually comes from the people who have already experienced what you are going through now. That’s why we display real-life testimonials on our website from people who have experienced the compassion and care that Homewatch CareGivers Northshore can provide. 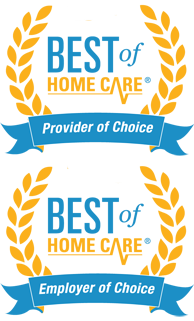 Are we the Best Home Care Agency in Northbrook? That’s for our clients to decide, however, after reading our client reviews and testimonials, you can take comfort in knowing that many others that have been in your shoes have trusted Homewatch CareGivers Northshore to provide dependable home health care services tailored to meet the needs of their loved ones. To learn more about the comprehensive in-home care services, senior and elder care services, Alzheimer’s & dementia care, as well as home health care services we provide to Northbrook IL area residents and to see what level of care you or your loved one may need please contact us at (847) 616-5600 or CLICK HERE to schedule a FREE – NO OBLIGATION HOME CARE ASSESSMENT.